TANK A PEEK Treadnauts gives competitive platform fighters a kiss of physics finesse. Gracefully pilot your tank through gorgeous arenas to land a deadly shot on your opponents! You've got a slew of useful tricks at your disposal, including treads that stick to any wall, boosters for midair hops, zero-friction slides, and rocket jumps for soaring into the sky. It's all about moving with style! TANK YOUR PICK - Four playable zones, each with unique mechanics and physics objects - Explosive couch competitive mode for 2-4 artillery rocket scientists - Computer AI tanks with three difficulty levels - Single-player Target Test mode with medals to earn - Laser guns, grappling hooks, homing shells, and tons of other power-ups to collect - A dynamic soundtrack by King Felix that changes every time you play - Player progression with levels, maps and characters to unlock - Modifiers to shake things up: zero gravity, slow motion, chaos mode and many more! TANK FLIGHT!! Treadnauts was released on PS4, Switch and Xbox One 248d ago in the US and the UK. 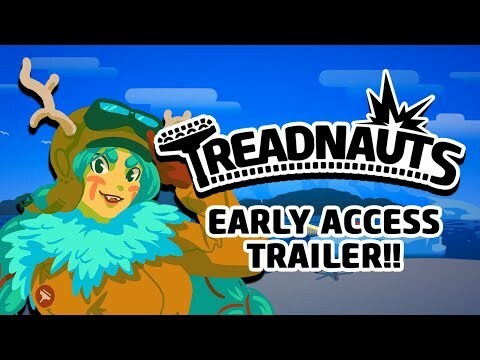 Notify me when Treadnauts is available.